Here’s one of the more damning comparisons to a Best Picture Oscar winner you can make: Disconnect is basically 2004’s Crash, only instead of solving racism, everybody just texts and Facebooks a lot. Quasi-poignancy frequently gives way to simplistic moralizing and preachy behavior-modification in this triptych of stories that show how the Internet is gonna getcha! The interlocking tales are as follows: Stephen (Alexander Skarsgård) and Cindy (Paula Patton) have a marriage falling apart after the death of a child. She seeks comfort in online support groups, which may be how their identities get stolen and they get robbed blind. Internet bad! Then there’s Jason (Colin Ford) and Frye (Aviad Bernstein), who are kids we meet peeing into protein drinks and putting them back on the shelf for unsuspecting gym patrons to purchase. They torment Ben (Jonah Bobo) by going all Manti T’eo on him, creating a fake girl who goads him into revealing things they share with the rest of the high school. Internet really bad! Finally, Nina (Andrea Riseborough) is an investigative journalist who meets Kyle (Max Thieriot) on a filthy awful website run by filthy awful people who keep teenagers in filthy awful conditions to do sexshows on the web. Internet super, super really bad! The stories bump into each other via a private eye, Mike (Frank Grillo), hired by Stephen and Cindy; he happens to be Jason’s dad. 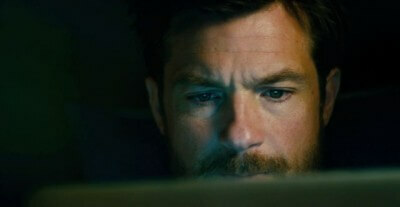 And Ben’s dad, Rich (Jason Bateman), happens to be a lawyer for Nina’s station. It’s kind of like Pulp Fiction only with a lot more shaming audiences for using social media. To say that the theme of Disconnect is obvious is to call nuclear war a “regrettable decision.” Hell, the title may as well have a declamatory exclamation point: “DISCONNECT!” The poster could simply be a finger pointing at someone texting at the dinner table. Writer Andrew Stern definitely attempts to explore the new social fabric, but the script is like an ax used for brain surgery. At least director Henry Alex Rubin resisted the urge to include flashing neon text explaining every scene. The performers are mostly good, as Bateman shows once more that he’s capable of more than wry comedy and Patton reminds us she’s more talented than being relegated to an action hero’s arm candy. Even some of the genesis for the stories are decent; if Stephen and Cindy’s story had been more introspective and examined how external options for coping are both helpful and potentially damaging to fragile couple-hood instead of turning into a weird cat-and-mouse game of “to catch an ID thief,” it could have been resonant. What happens to Ben and family is straight up “afterschool special” though. Disconnect is overambitious, which can be a good thing, but not when it is paired with sloppy execution. Is there a need for film to consider the ways in which modern communication has warped interaction? Maybe. But watching people type messages to each other has never been fun, and treating the Internet like a bogeyman is downright silly.